Don’t believe anyone if they tell you crocheting isn’t cool! Take it from me; as a yarn skeptic, I wasn’t convinced that I could ever enjoy crochet. Recently, though, I was proved wrong. In our office, we took a class together so we could learn how to crochet. 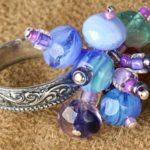 I thought I would struggle through the class, since I tend to mess up any kind of craft that involves weaving, sewing, embroidery…really anything that doesn’t involve paint or clay. But to my surprise, I made the starting chain with ease, and quickly picked up on the basic crochet stitch we’d be using to make our dish cloths. In minutes, I was crocheting faster than the speed of light! Okay, I might be exaggerating a little. But watching my hands create something I never thought I could do was just so exciting. I caught myself daydreaming about improving my skills to the point where I could make all of my Christmas gifts from crochet projects. Learning to crochet is easier than you might think. After all, if I had a blast accomplishing a simple little dish cloth, just imagine how much fun you’ll have trying the easy crochet projects on this list. These beginner crochet patterns are the perfect way to get kids hooked on crochet. 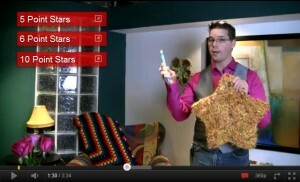 You might just have a crochet expert in your house before you know it! Every one of these adorable crochet projects is easy for kids and teens to make. Try them all! If I still haven’t convinced you that you can crochet with confidence, you can always try taking a crochet class. And have I got the perfect class for you! 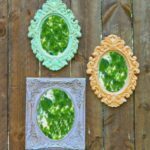 Annie’s Crafts runs incredible online video tutorials that will teach you just about any crafting trade, and AllFreeKidsCrafts is currently giving away free access to the Learn to Crochet Class! You’ll be able to follow along with the video and practice the essential crochet stitches you’ll need to churn out five pretty projects. Our giveaway ends on November 9, 2013 at 11:59:59 p.m. Eastern Time, so make sure you enter today for your chance to win! What do you want to crochet? In my recent rendezvous into the world of crochet, I recently learned how to crochet the bobble stitch. Perfect for scarves, purses, and sweaters, this fun stitch is great for adding dimension and texture to your projects. Once I started crocheting with the bobble stitch, I just couldn’t stop myself! I’ve added it to almost all my open projects and I’m always looking for fun bobble stitch patterns to make for my family and friends. If you want to venture into creating the bobble stitch, I’ve gathered up some of my favorite patterns to help you on your way. 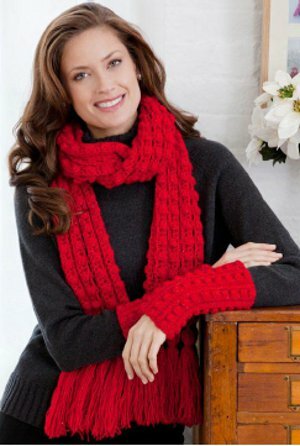 These crochet patterns are easy and fun…and perfect for holiday gift giving. 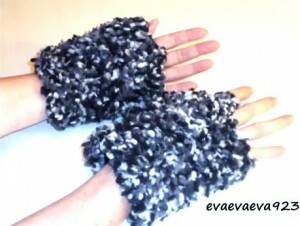 I love this Shimmering Lacy Bobble Scarf and Wristlets set. This textured crochet pattern is great for Christmas and can be worn by women and men of all ages. The use of Shimmer Yarn gives this winter set a nice sparkle, but you can easily use regular Red Heart yarn as well. This is a perfect pattern if you’re new to the bobble stitch, since you’ll be repeating the stitch several times! If you’re feeling really adventurous, you can create a matching hat to complete the set! If you’re looking for something nice and warm to cuddle up with during the cold winter months, you just have to check out the Aran Crochet Throw, made with a beautiful bobble stitch accent. This pattern is a little more advanced than the others, so if you’re looking for a challenge, you’ve come to the right place! 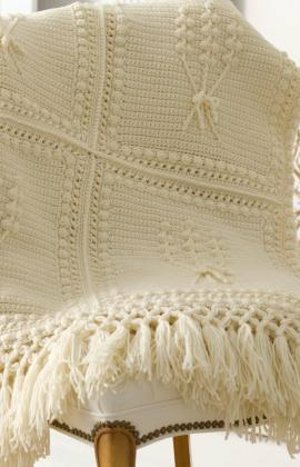 This lovely crochet afghan can be made in any color, but I love the soft white of this pattern…and it makes it perfect for any room in my house, regardless of the decor scheme. One of my favorite bobble stitch patterns is this adorable Brain Freeze Ice Cream Sleeve. When you have one of those days that only a small pint of ice cream can cure, use this cozy to keep your fingers from freezing as you dive in for another bite. This wrap can easily be altered to fit a container of any size, and can even be used as a coffee mug wrap as well. Have you tried crocheting the bobble stitch? What’s your favorite bobble stitch crochet pattern? What you see in this picture is 2 identical patterns. The one on top with all of the coloured Bernat Softee Chunky is the normal size version of this Catherine Wheel Stitch. Simply by switching the hook to a P Size and ensuring you are using 3 strings at one time, the massive difference between the two is outstanding. 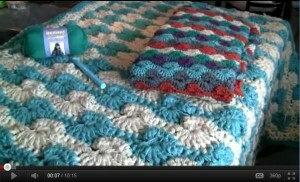 Learn how to Crochet A Massive Granny Square Using This Technique. Try extreme granny squares on this Beautiful Cream Afghan Pattern; this will give your squares some punch. Follow along with this great tutorial to begin making your own Wristlets. EveaMarie really does a fab job in presenting this video. Click this picture to begin your free tutorial. EveaMarie, a new host for AllFreeCrochet, has just released a brand new tutorial called One Skein Wristlets. Grab your crochet hook and follow along with her. She makes following along easy and you can keep your wrists warm all winter long. 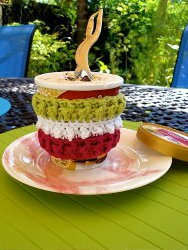 You can continue to receive many more free patterns at AllFreeCrochet.com. Here’s a free Wrist Cuff Pattern. Celebrate Your Love of Fiber on I Love Yarn Day! Do you knit and crochet or just absolutely adore fiber? If this describes you, then October 14 is your day to tell the world. Celebrate I Love Yarn Day along with the Craft Yarn Council this October. Whether you knit it, crochet it, wear it, post it, tweet it, carry it, share it, give it, or bomb it, you will join fiber enthusiasts around the nation who love yarn just as much as you do! And by spreading the word about how amazing fiber can be, you might even inspire another knitter or crocheter or two! We also have several easy knitting and crochet patterns on AllFreeKnitting and AllFreeCrochet that would be great to make and wear on I Love Yarn Day. Don’t miss a couple of our favorites below! How will you celebrate I Love Yarn Day? Tell us in the comments! Hey guys (and gals of course)! 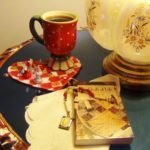 Because you are all such great fans and supporters of AllFreeCrochet.com I thought I’d come out with a brand new eBook for you to enjoy. I wanted to pick out some of the best free crochet patterns I could find and some of the popular ones you may have seen in the newsletter Hooked on Crochet. The 17 Popular Free Crochet Patterns eBook is free to download so you don’t have to pay a single penny! 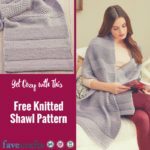 Some of the great patterns you will find once you download it are shawls, hats, doilies, free crochet afghan patterns and much more. Remember the Framed Church Window? That’s in here too. 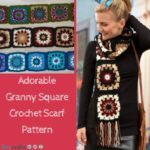 17 Popular Free Crochet Patterns eBook is your one-stop shop for the best free crochet patterns around. And since it’s free to download this eBook, you can get all 17 patterns immediately: just click on the download link and the PDF will download right away. Then you can print it or save it on your desktop. Download this fabulous eBook for free now! 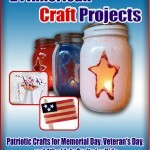 After you download it, tell me what some of your favorite patterns are from this eBook! I’ve been crocheting for over 15 years. But I didn’t learn it from my grandmother, even though she crocheted all the time. Nor did I learn from my mother, who can do basic crochet stitches but never learned to read a pattern. 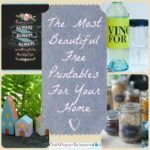 The legacy of handmade crafts and needlework that had been passed down for generations in our family came to an abrupt halt when it came to me. Not that I wasn’t interested; I’ve always been a crafty sort. I just didn’t have the patience to sit down with someone else and learn a specific technique. For me it all started with a little pamphlet titled “Teach Yourself Crochet!” I don’t even remember where I got it. I was 19 or 20 and bored, looking through my collection of forgotten books for something to do. I found that pamphlet, a small stash of yarn – probably from Grandma – and a hook, and prepared for what I was convinced would be a long, hard learning process. To my surprise (and relief) it was easy! It came to me like I’d been crocheting all my life. My stitches were uneven, my grasp of pattern abbreviations a little slow, but it just felt right. I’d dabbled in other needlecrafts before, with some success. None of them felt as natural and easy as crochet. As I started making more complex patterns, the mathematical nature of crochet became clear. I realized that it wasn’t just this square that added three stitches at the corner to make a crisp turn – it was every square. I realized that making a perfect circle was as easy as increasing the same amount of stitches in every round. I realized that nice, even edges were a simple matter of making the correct number of turning chains every time. Each new a-ha! moment increased my confidence in this new craft. Confidence led to speed, practice led to better technique, and experience made reading patterns easy. Now crochet is something I can do without really thinking about it – which makes it relaxing rather than a source of frustration and stress. It never ceases to amaze me how a handful of yarn or ball of thread can become a thing of beauty. 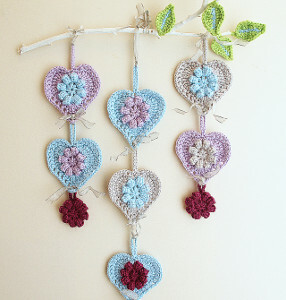 Crochet can enrich your life in so many ways. The repetitive motion calms you physically and emotionally. The unfolding of each beautiful new project really boosts your self-esteem. As your project nears completion, you get a wonderful sense of accomplishment. 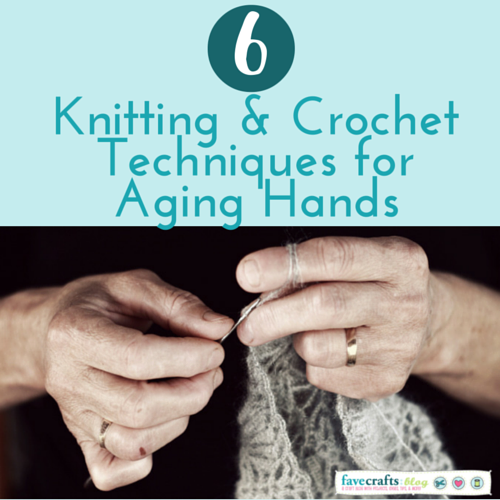 No matter how simple or complex the project, crochet is just plain good for you! 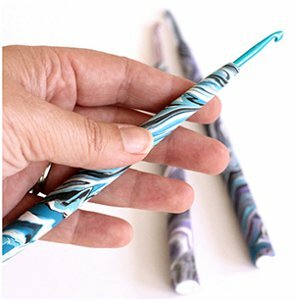 If you’re just starting out, there are plenty of online resources to help you gain confidence and improve your technique – not to mention free crochet patterns! Check out the Basics section of AllFreeCrochet.com for all kinds of tips, how-to articles, and simple projects. 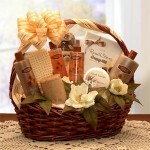 Even the humblest project can become a cherished gift or a beautiful addition to your home. 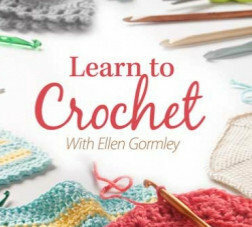 Get crocheting today!